DUMBARTON were well beaten by hosts Greenock Morton in the William Hill Scottish Cup at Cappielow in front of a 1,760 crowd. DUMBARTON were well beaten by hosts Greenock Morton in the William Hill Scottish Cup fifth round at Cappielow in front of a 1,760 crowd. Bidding for a place in the quarter-finals, Stevie Aitken's men were invariably second best to a very fit and imaginative home side. Jim Duffy's men applied pressure from the word go, and on 12 minutes found themselves in front. A neat one-two sent Morton's Frank Ross through, and he chipped Scott Gallacher in the Sons goal to make it 1-0. Dumbarton had a couple of half chances towards the end of the opening period, but struggled to get into gear throughout. The Greenock men struck again immediately after the break. Jack Iredale was left with a simple finish for 2-0 at the near post after Sons failed to clear their lines. 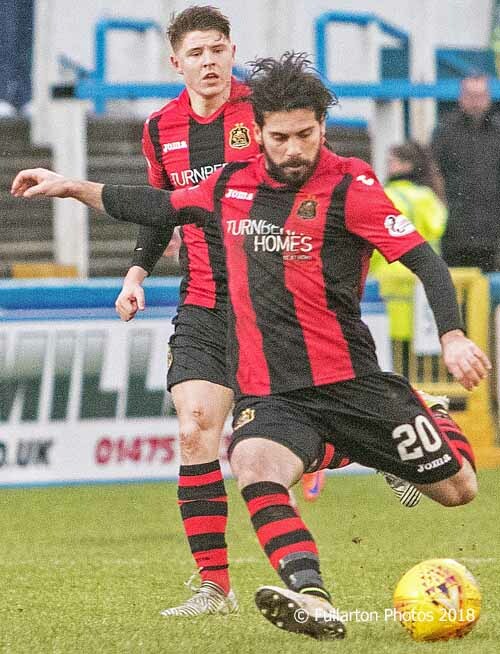 Dumbarton pressed back but struggled to create chances in the final third and Morton soon regained control. On 80 minutes they booked their place in the quarter-finals when Bob McHugh converted for 3-0 from close range. Dimitris Froxylias is pictured lining up a shot.